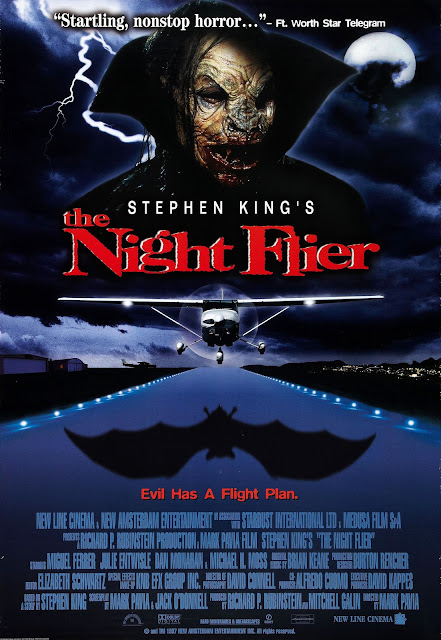 Two investigative reporters for a tabloid magazine track down across country "The Night Flier", a serial killer who travels by private plane stalking victims in rural airports. Here we have another film taken from a Stephen King short story of the same name, in my opinion this one is severely overlooked, let me explain why. First of all lets talk casting. Miguel Ferrer as Richard Dees is fantastic, the fact our main character isn't a very likeable person is a rarity you see in films, yes we can have an un-likeable character in a group of characters but this guy is our one and only lead. The supporting role played by actress Julie Entwisle who bears an amazing resemblance to "Gremlins" star Phoebe Cates, I even thought it was her till I saw the credits roll. This film would sadly be only her second and last film and then she just disappeared from the business which is a shame as she showed a-lot of promise here. This film was also Mark Pavia's first and only time directing a commercial release. He weaves an interesting story and it flows very nicely, the fact he did the whole thing on a budget of $1million is an achievement in itself, which you see when you watch the film. The film does look like a made-for-TV movie but that just adds to it's charm, it actually looks like a high budget made-for-TV movie. Unfortunately this was made when Kings popularity was in decline so a-lot of people snubbed it, they made a big mistake. In the scene where Katherine is looking at all of Richard's bylines, the framed copies of "Inside View" contain many references to other stories by 'King, Stephen': "Springhill Jack Strikes Again!" - Strawberry Spring. "Headless Lamaze Leads To Successful Birth!" - The Breathing Method. "Kiddie Cultists in Kansas Worship Creepy Voodoo God!" - Children of the Corn "Satanic Shopkeeper Sells Gory Goodies!" - Needful Things. "Naked Demons Levelled My Lawn!" 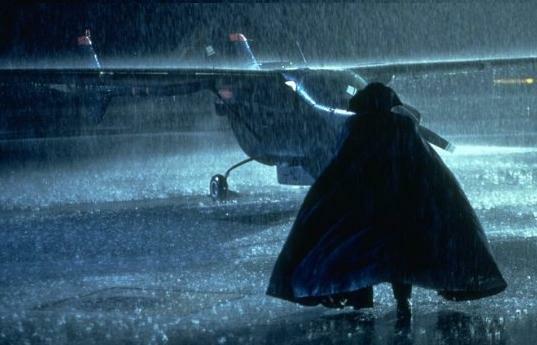 - The Lawnmower Man "The Ultimate Killer Diet! Gypsy Curse Flays Fat Lawyer's Flesh" - Thinner. Richard Dees, the main character, was also the reporter who tried to get an interview with John Smith in the Stephen King novel "The Dead Zone". Many of the murder photos in the press office are real, including the one of the horribly mutilated prostitute. They were taken from the photo album of a homicide detective who worked in LA from the 1930s to the 1950s, which would later be published under the title "Death Scenes". Aaron Michael Lacey screen-tested for the role of the vampiric Cessna pilot, "The Night Flier." While talking in the bar, Richard tells Catherine stories, mentioning a school teacher who murders five year old kids because she thinks they're plotting to kill her. This is the plot of a story from the Stephen King short story collection Nightmares and Dreamscapes.